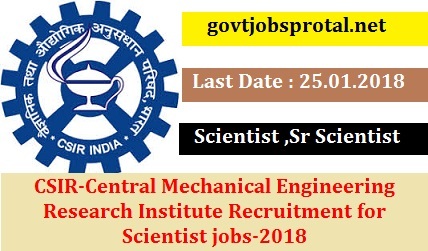 CSIR-CMERI, Durgapur is a premier Institute under the Council of Scientific and Industrial Research (CSIR), involved in multidisciplinary R&D programmes of both basic and applied nature across scientific disciplines for economic, environmental and societal benefits for the people of India. As the only national laboratory dedicated to mechanical engineering, the core mission of the CSIRCMERI is to conduct research and develop cost effective and value added technologies in mechanical engineering and allied domains. Yet another element of CSIR-CMERI’s mission is to contribute significantly to national skill development initiatives for sustainable empowerment. CSIR-CMERI envisages emerging as a global R&D institute having confidence of industries and visibility to society in mechanical engineering sciences and technologies. The research activities of CSIR-CMERI extends over Advanced Design and Analysis; Robotics & Mechatronics, Advanced Manufacturing and Metrology, Electronics & Embedded Systems, Drives & Control; Near Netshape Manufacturing, Micro-Systems Technologies; Precision Farm Machinery; Advanced Functional Materials, NDT and Condition Monitoring, Tribology; Product and Process Design, Renewable Energy Technologies. a). These posts carry usual allowance i.e. Dearness Allowance (DA), House Rent Allowance (HRA), Transport Allowance (TA) etc. as admissible to the Central Government employees and as made applicable to CSIR. Council employees are also eligible for accommodation of their entitled type as per CSIR allotment rules depending on availability in which case HRA will not be admissible. b. In addition to the emoluments indicated against posts, benefits such as reimbursements of Medical Expenses, Leave Travel Concession, Conveyance advance and House Building Advance are available as per rules of CSIR. c. Scientists in CSIR are also permitted to undertake consultancy and sponsored R&D project activities. These activities give them scope to earn consultancy fee and honorarium as per guidelines governing these activities. Opportunities also arise for foreign deputations for training/presentation of papers/specific assignments etc. d. CSIR provide excellent opportunities to deserving candidates for career advancement under Assessment Promotion scheme for Scientists. Mode of Selection: Mere fulfillment of educational qualifications and experience does not entitle a candidate to be called for interview. The duly constituted screening Committee will adopt its own criteria for shortlisting the candidates. The candidate should, therefore, mention in the application all the qualifications and experience in the relevant area over and above the minimum prescribed qualification, supported with documents. Completion of Ph.D degree will be reckoned from the date of issue of provisional certificate/notification. a. Eligible candidates are required to apply online through our website www.cmeri.res.in. b. If a candidate does not have a valid email id, he/she should create a new valid email id before applying online. c. Online application will be available on our website www.cmeri.res.in up to 25.01.2018.
d. The non-refundable application fee of `100/- where applicable may be deposited through https://www.onlinesbi.com /prelogin/icollecthome. htm?corpID=377679 and printed copy of ereceipt must be enclosed with the application. The candidates belonging to SC/ST/PWD/Women/CSIR Employees/Candidates otherwise eligible but residing abroad are exempted from submission of application fee. e. In case of Universities/Institutes awarding CGPA/SGPA/OGPA grades etc, candidates are requested to convert the same into percentage based on the formula as per their University/Institute. (You will get more information in employment News paper dated on 30/12/.2017 Page no.(18).) Visit the official website for more information.